The next group of basic blackjack strategy to discover is the splitting pairs (also paired hands). This situation occurs when the player gets two cards with the same value, e.g. 4 + 4 or the Queen + the Jack (both the cards have the value of 10 points). 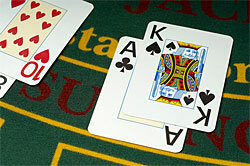 Pairs obtain the additional option of splitting (or just split) into two independent and separate hands to play. Also the blackjack rules say that it requires an additional bet for the newly created hand (usually the next wager is equal to the initial one). With pairs on hand it's quite easy to operate them consulting the charts given below. You will be usually recommended to stand with 10's, do not split 5's and either hit or split with other combinations of cards. You may even try to memorize it from cover to cover. Also you may just print it or launch in a browser tab while playing casino online blackjack. *Hit = if double down is banned after splitting. 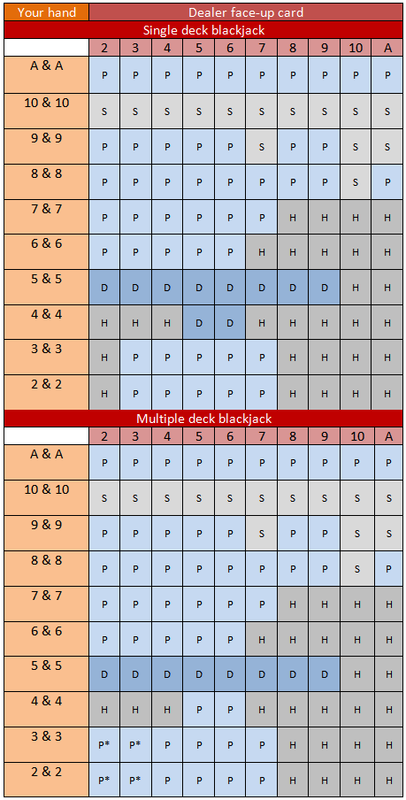 Operating the basic blackjack strategy charts for splitting pairs is quite simple procedure to learn. The chart heading gives you the first and principal hints. Then you just choose the row which suits to your initial pair combination and the column which views the dealer face-up card. Match the cross cell and get the recommended answer.